I have to give props to Pete tho, yo... *too much idol*... He sucked it up and went bike riding with us this afternoon... I thought it wasn't too terrible.. until we turned around to come home and the wind was hitting us straight on.. I thought my legs were going to fall off b/f I could get home. 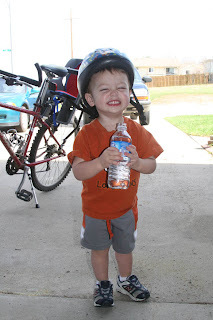 Ben makes a cute bike-rider! Hope the boys are feeling better soon.